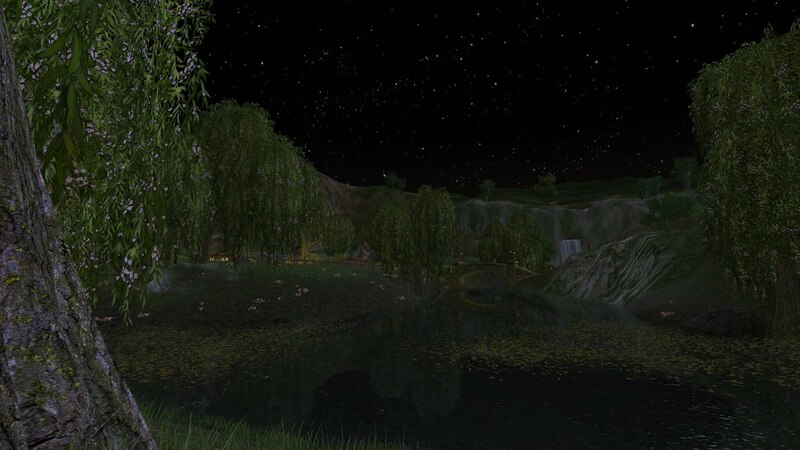 The quiet village of Elderglen is situated in a peacefull mountain valley in the Southfarthing. According to the Elves of Imladris, the valley itself formed long ago when bigs slabs of ice crawled West from the cold lands of Ered Luin. While crawling forward they pushed up the earth underneath, creating the beautifull hills of the Shire. But all the ice has been long gone, leaving us our secluded green valley and a wonderfull new area to live in. Elderglen nowadays is the home of the Elder Falls. While passing the old Water Mill, its fresh waters stream towards the crystal clear Crystal Star Lake which is surrounded by blossoming Willows. A few Oak Jetties have been build around the lake for Angling enthousiastics providing grand spots to reel in a magnificent catch! The hills around Elder Lake are covered with Apple trees, Birches and Oaks, providing lovely shaded spots for an afternoon picknick or a Hobbity nap. Upon the highest hill in the Village stands the Cornmill. It was build in the traditional style we know so well from the Shire. Our pride and joy is the Elderglen nightly sky covered in sparkling stars. It truly feels like heaven on Middle Earth! A grand nightly sky view off Elderglen's Crystal Star Lake, towards Elder Falls. Scattered amongst the flowing hills surrounding Elder Lake, 30 new burrows have been build. The new burrows have been connected by paved country lanes all leading towards Elder Square, the lively square of the village. At the inaugural meeting of inhabitants it has been decided to regard Elderglen as a Residents Association. Chairhobbit: Pete Proudfoot, better known as Onionfarmer Pete. Shirriff: Pogodoc Spudplucker, holding office at 6 Myrtle Court.